We’ve already come across a way to transform your Facebook feed to make it look like Pinterest, and it was only a matter of time before someone came up with something similar for Google+. Using the aptly named Greasemonkey userscript Google+ Pinterest, you can instantly transform your Google+ feed into a Pinterest-like grid of posts and photos. To install a userscript on Firefox, make sure you have the Greasemonkey add-on installed, while Safari users can opt for GreaseKit. Chrome users can simply install the userscript directly from the site. With Google+ recently introducing a revamped design, the look hasn’t gone down well among all of its users. If you’ve been particularly annoyed by that great big chunk of white space glaring back at you, and aren’t sure what to do with it, this is a great way to get rid of it. Once you’ve installed the userscript, your Google+ newsfeed will be transformed into three columns, and photos, of course, really come to life with the new layout. The same goes for profile pages, and Google+ pages, with all the content displayed in a grid. The changes are of course only skin-deep, allowing you to interact with Google+ as you normally would – leaving comments, sharing content and more. Aside from giving your Google+ feed the ultimate Pinterest feel, the script also puts the focus on the content you’re viewing, hiding the menu and chat window out of sight. The menu slides into sight when you hover over the left hand side of the screen, with the same effect used to slide the chat window into sight on the right hand side. If you follow a lot of photographers on Google+, this userscript offers a pretty visually appealing way to keep up with their latest images. Unlike its Facebook counterpart, there is no real Pinterest integration here, and the process of pinning or repinning content is nowhere to be found. 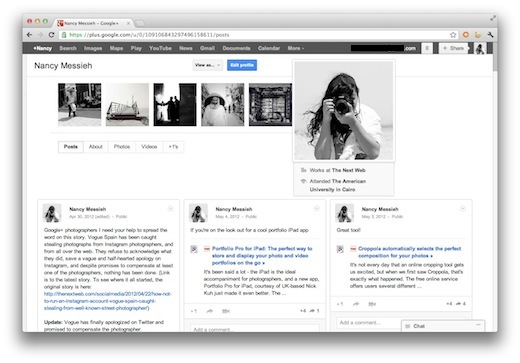 It’s simply a cool way to reinvent your Google+ experience. 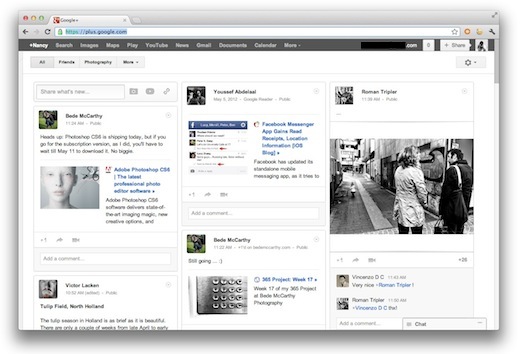 What do you think of bringing some of the Pinterest feel to Google+? Let us know in the comments.